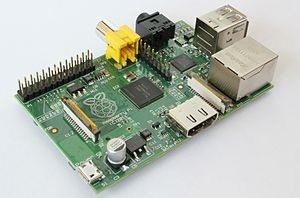 Before you can control the Raspberry Pi from the Internet, you must first install server software. I found the Apache2 server software very easy to install. Here the steps that I used to install and setup the Raspberry Pi for internet control. The steps are not hard at all. 1. Recognize that the RPi's default user name is: pi and that the default password is: raspberry. If you made changes to the user name and password, please remember them! 4. Now, we are going to set up SSH so that we can do everything else from a different computer. To do this, first note the I.P. address of the Raspberry Pi. At the command line, type: ifconfig and press return/enter. In my case, I selected "8. Advanced Options"
8. In the Advanced Options window, I selected Option A4 and then proceeded to enable SSH. Once selected, the Raspberry Pi will then enable SSH for you. You can then exit the Raspi-Config application. 9. At this point, you could unplug the cords for your USB keyboard and your monitor. These are no longer necessary, as everything else will be done over SSH. I didn't do that since I work directly with my RPI. If you want to work remotely, download an SSH client like PuTTy which can be downloaded for free from Google and connect to the IP address of your Raspberry Pi logging in with the username "pi" and the password you set earlier. I show an image to the right. 12. Enter the I.P. address of your Raspberry Pi into your web browser. You should see a simple page that says "It Works!" 13. One additional capability that you should have for your Raspberry Pi is FTP. This will allow you to transfer files to and from your Pi. 18. You can now FTP using the Pi user and access the /var/www folder via a shortcut that should appear on login. 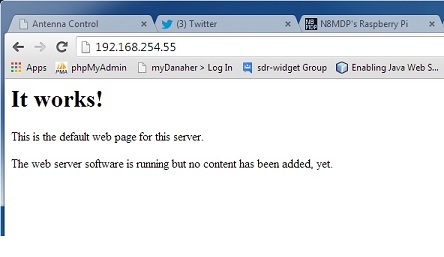 With this process completed, you now have a working web server on your Pi!